As Dying Matters Week draws to a close, I wanted to share with you my personal experience of organ donation. It’s vital we feel able to talk about aspects of death like this. I have shared, in quite some detail, the process that is necessary in order to donate organs to another – a dilemma we were faced with when Abi died (so grab a coffee and a tissue!). 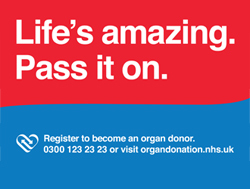 If you are considering joining the organ donation register, you may find this post useful. It contains details of the steps involved and how complex the process is, which was something we certainly never realised until we were there. Abi had collapsed into a coma following a sudden brain haemorrhage at home. The prognosis wasn’t good but the brilliant neuro surgeons at Frenchay Hospital in Bristol operated on her anyway the same night; she had just a 5% chance of survival at that point, but any percentage was enough to give us a slim hope. I heard on the news today that – shock, surprise – people don’t like talking about death! This type of ‘research’ irritates me. Of course we don’t like talking about death and our mortality. It’s depressing for a start, not to mention bringing up painful emotions, or making us realise we’re not getting any younger. I can recall rolling my eyes at my husband for wanting to sort out our life insurance, booooring! Why can’t we talk about holidays instead? We only wrote our wills a couple of years ago, with three children at that point we felt it probably about time. If I’m honest, it wasn’t nearly as depressing a task as I thought, in fact it felt quite good to know my children were protected should we die while they still needed us to care for them. Looking back, we were on a sort of auto pilot when we knew that Abi would die. Far from the panic and distress of her collapse at home, our situation was now more peaceful, with an element of tension. We could ask the consultant to turn off the life support machine when we were ready. It gave us some sense of calm control over the situation. Of course, you’d think the natural instinct would be to refuse… to never let them turn the machine off… to cling to her lifeless body, to wait just one more day. But we knew, we just knew in our hearts that Abi had died on our bedroom floor three days before, we knew she wasn’t coming back. So we were in some ways ready for the turning off of her machine and wanted it done as soon as we said. The organ donation aspect did mean the terrible process felt ‘drawn out’, but we knew it was an important factor in Abi’s life and death. A part of her legacy if you like. The evening before her death, while we were sat with her while waiting for the organ donation team to sort things out, we were able to make some mementos of Abi. The nurse caring for her brought out a box, with paint and paper, for hand prints, and ribbons for locks of hair. These things I recall doing when Abi was a baby, but doing it now took on a whole new meaning. 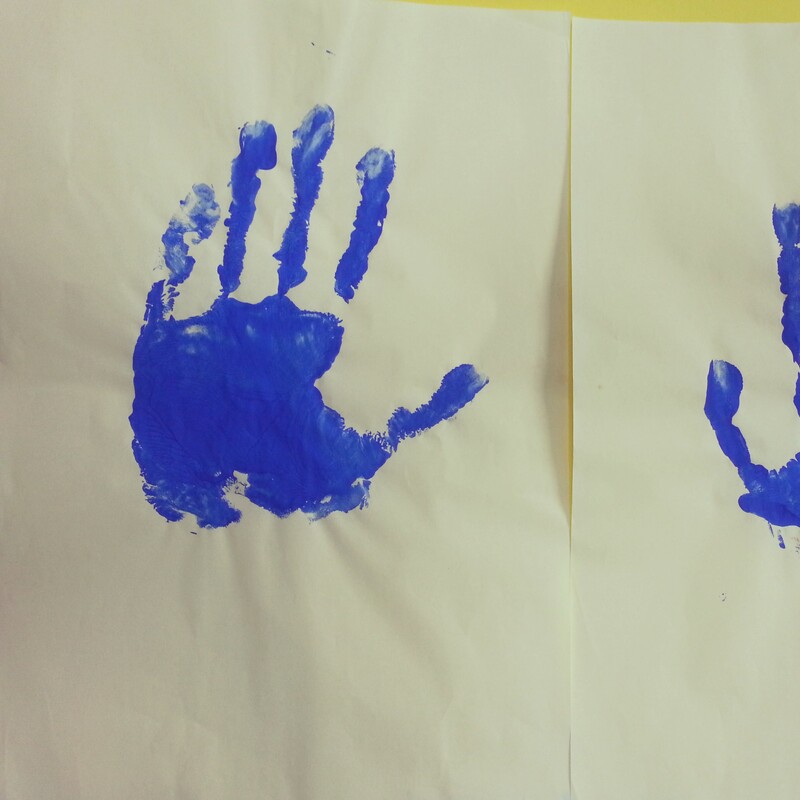 We carefully took three hand prints – a practice one, and one of each hand – in blue paint, her favourite colour. It took three of us to do this as she had no movement and it was fiddly, but the prints came out well. I then went and stood behind the head of the bed (you could walk all around the bed as it was in the middle of a large room), and plaited a section of her hair and then cut it out. I felt somewhat guilty for cutting her lovely long hair as I knew she wouldn’t like it, but I knew we would need this to hold and comfort us when all this was over. 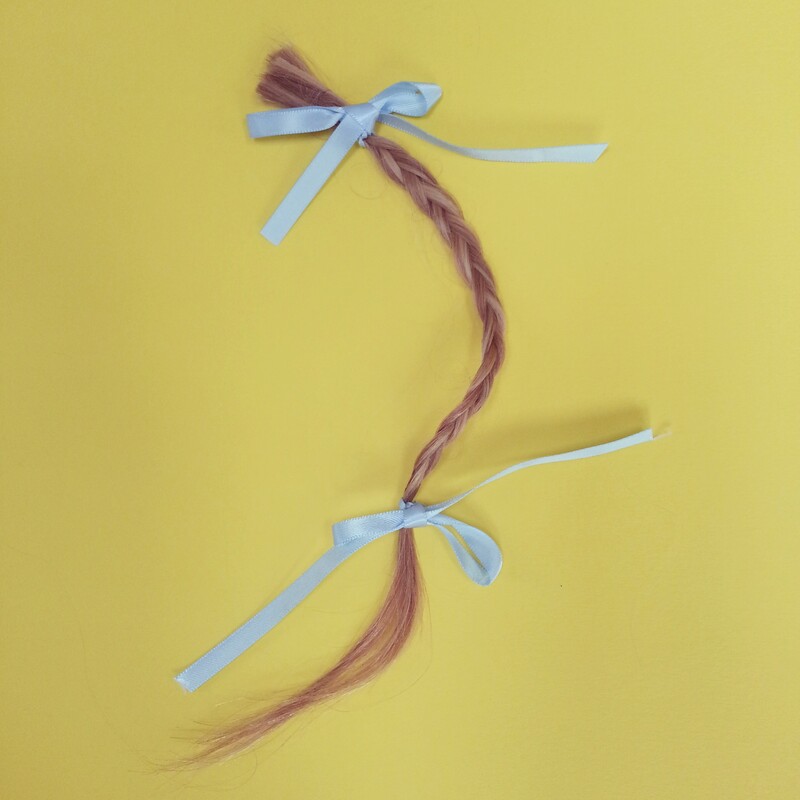 I tied each end of the plait with light blue ribbon. The nurse left us alone with Abi for periods during this night, so that we could spend time with her in private. We kissed her cheeks and hands, stroked her forehead and talked to her. We told her again how much we loved her, how proud we were of her; we didn’t talk of her dying, we just recalled our fond memories of holidays gone by, of her hopes and dreams. We always talked to her as though she would recover. We played ‘Yellow*’ to her on my husband’s phone, placing the phone by her ear. Tears flowed, as they always do when we hear this song, but this time they were tears of love mixed with the deepest sorrow I’ve ever felt. I felt the first intense pangs of grief at that point – the feeling that I can only allow myself to feel for short periods because it is so overwhelming. But as much as the pain of seeing her this way and knowing that in the morning she would be gone was too much to bear, so too was living our days like this. It was a form of torture that I’ve no doubt would impact me deeply if it continued this way forever… it had to end to save our sanity as well as to save her from further ‘suffering’ living this way. It was getting late and we were both exhausted… we really wanted to have clear heads when Abi’s life support was turned off, so we went up to our room to try to sleep… and wait for the inevitable phone call that would mean the end was now. *Yellow by Coldplay was the song that played in our car as we went home from hospital when Abi was born. I can recall as though it were yesterday, I was sat in the back seat with her in her car seat, looking so tiny in a yellow knitted cardigan and bonnet, tears streaming down my face in joy and anticipation of being a new mother. The song seemed to reflect everything of Abi and our love for her – she was blonde, sunny, yellow… the stars did seem to shine just for her.